This is a watercolor seascape demonstration painting based on a photo of Surf Beach down near Batemans Bay in New South Wales. 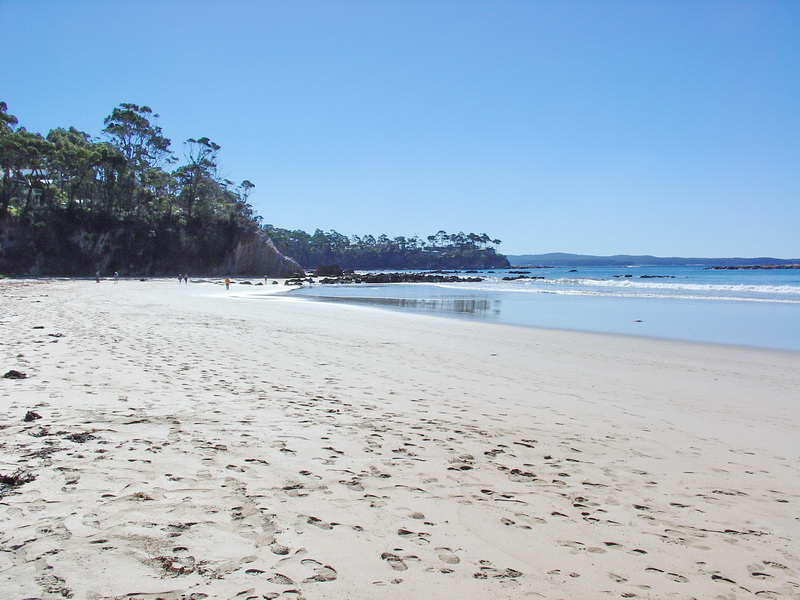 When you live in coastal Australia you see lots of beaches like this. 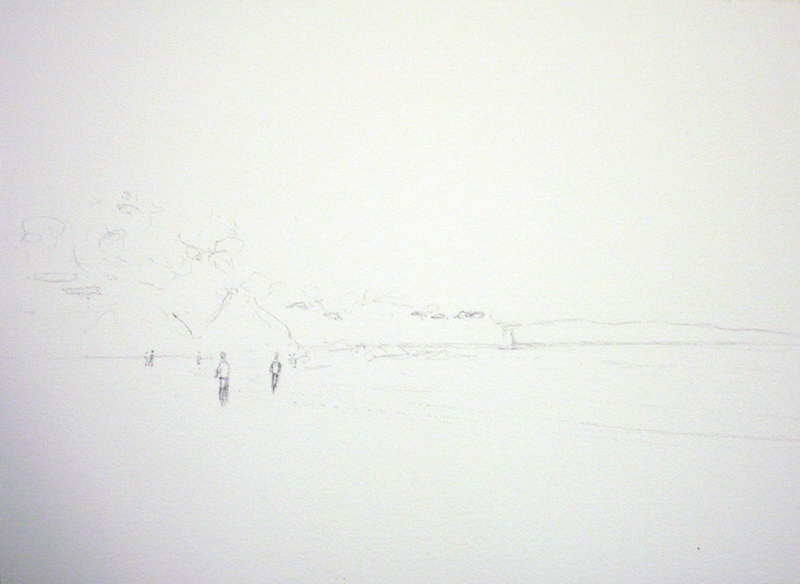 Beach scenes are relatively easy to do compared to street scenes and figure work. However they can still be a challenge to beginner watercolor artists. Arches 300gsm Rough Watercolour Paper, quarter sheet (approx. 15” x 11” (38cm x 28cm). Brushes: Round -Sizes 24 and 16 for larger washes and 12 and 10 for the smaller areas and detail. Paints: All Winsor and Newton – Cobalt Blue, French Ultramarine, Raw Umber, Burnt Sienna, Alizarin Crimson, Cobalt Turquoise, are the main colors. Other items are backing board, masking tape, old towel to control wetness of your brushes, tissues, etc. Do a loose drawing of this scene. Draw a line across the sheet at eye level (horizon line) and then adjust everything from there. Remember to put the figures heads all on about the same level i.e. just above or below the horizon line. Make sure you only put in a narrow strip of water as is in the photograph – don’t make the waterline head straight down the page or it may look like the water in your painting is trying to go uphill. Put very little detail in the distant hill, with more detail as you come forward in your scene.